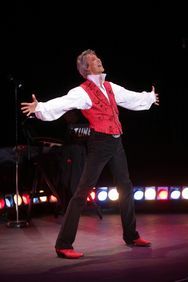 After a successful opening night New Year’s Eve at The Colony, Broadway superstar Tommy Tune burst back into the hotel’s Royal Room on Friday to continue his debut run with his tightly knit show, Taps, Tunes and Tall Tales, a 70-minute program that offered plenty of all three. Decked out in a holiday-red suit (his mother’s favorite color), the famously vertical Texas trouper – designated as a “living New York landmark” in 2009 — commanded the stage from the opening number through two encores. The autobiographical revue covers Tune’s remarkable 55 years in show business, during which he has won nine Tony Awards as a performer, choreographer and/or director; been honored with a National Medal of Arts; and worked the stages of the world from Broadway, then Hollywood, Vegas, Moscow and everywhere in between. Ably accompanied by a trio led by Michael Biagi, his pianist and musical director for 38 years, Tune tells his tall tale through a select collection of pop and show tunes, stitched together with show-biz anecdotes and accented by the occasional eight or so bars of tap. The show has impressive production elements (custom lighting and music cues and even a simple set consisting of a small ladder – a nice touch) that extend the performance beyond the cabaret genre into almost a mini-musical. Maintaining a dollop of that wide-eyed wonder that brought him from Texas to New York, Tune recalls getting his first gig on his first audition on his first day in the Big Apple, then later getting a contract with 20th Century Fox in the last days of the studio system. He remembers working along the way with idols Fred Astaire and Gene Kelly, as well as some of the greatest leading ladies of stage and screen. He also pays tribute to his tap mentor Charles “Honi” Coles, with whom he shared the stage for nearly 800 performances of the Gershwin show My One and Only, during which the duo – as Broadway legend would have it – would routinely stop the show cold to several minutes of thunderous applause. The gee-whiz optimism that has been the star’s stock and trade is offset – almost to a fault — by a thread of melancholy that runs throughout: the highs of opening night balanced with the unknown of unemployment, even when a monster hit closes. Or the joys of new romance, beautifully told in a quiet reading of It Could Happen To You, tastefully contrasted with the pain of love lost in Kurt Weill’s nostalgic September Song. But up-tempo numbers such as Heart from Damn Yankees and Leiber and Stoller’s rollicking I’ve Got Them Feelin’ Too Good Today Blues, along with the tap sections, dropped in like the improvised solos of a jazz musician, kept the balance in check. However, one song – used to bookend the production — summed up the star’s motivation to keep performing, to move an audience as few have done, to keep going after five decades and to adapt to a world where the show business he grew up with seems to be fading: I Love It. The audience at The Colony certainly did.